Hard Cover, 192 pages, 9.25 x 11.25. 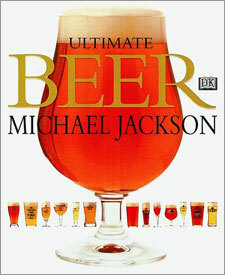 This is Michael Jackson's cornerstone book on beer. Its simply one of the best and most entertaining beer guides on the market. From the dust jacket: "The Ultimate Guide to more than 450 classic brews, presented by The Beer Hunter himself, Michael Jackson. Appreciate the flavors and ingredients of beer, from the sharp hoppy bite of an India Pale Ale to the rich, sweet malt of a German double bock. Learn to serve beers to complement wide range of food, from red and white meats, shellfish, and vegetarian specialties to chocolate and fruit deserts. Explore how cooking with different beers can enhance the flavors of both sweet and savory dishes. Discover and enjoy the unique characters of different styles of beer and choose the right one for every occasion."